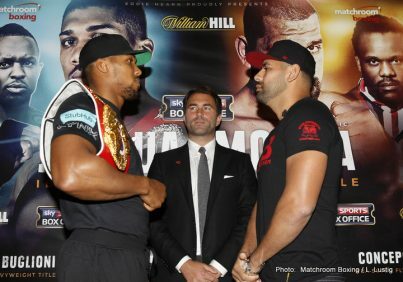 IBF Heavyweight World Champion Anthony Joshua and American challenger Eric Molina worked out for the British press on Tuesday in Manchester, England, as they prepare to square off this Saturday at Manchester Arena live on SHOWTIME® (5:30 p.m. ET/2:30 p.m. PT). The SHOWTIME BOXING INTERNATIONAL® presentation originates from Galen Center at USC in Los Angeles, site of that evening’s SHOWTIME CHAMPIONSHIP BOXING telecast. WBC Heavyweight World Champion Deontay Wilder will join host Brian Custer and analysts Al Bernstein and Paulie Malignaggi as part of the SHOWTIME announce team for Joshua vs. Molina. 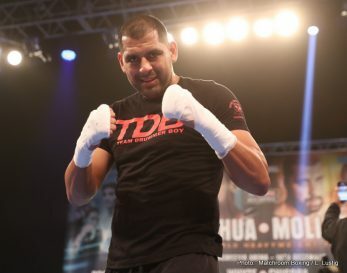 Undefeated sensation and 2012 Olympic Gold Medalist Joshua (17-0, 17 KOs) will make the second defense of his title against Molina (25-3 19 KOs), a Texas native getting his second shot at a belt in his quest to become the first Mexican-American heavyweight world champion. 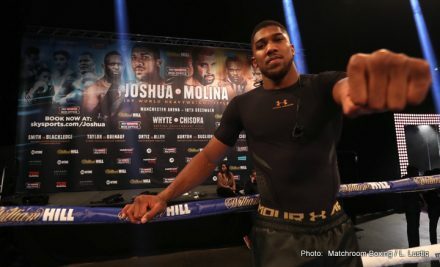 An encore presentation of Joshua vs. Molina will air as part of the SHOWTIME CHAMPIONSHIP BOXING telecast later that evening, following the main event showdown between WBA Featherweight World Champion Jesus Cuellar and three-division former champ Abner Mares. In the co-feature, Jermall Charlo will defend his IBF Junior Middleweight World Championship against fellow-undefeated challenger Julian Williams. “Eric is coming here to win and he’s got a goal in his sights and dreams to fulfill. I want to shatter his dreams and keep that title. He gave Wilder a real test, rocked him, and boxed through the fight with an injury. So he’s got ability, power and heart. “Eric has only lost to the best. He’s looked at as an underdog because a lot of it is about hype. This is his chance to announce himself. He might say he can beat me, but we won’t know until the night if he can pull it off. “This fight isn’t about Deontay Wilder. Deontay is supposed to be this KO artist with one-punch power and he’s been a pro for eight years now so he’s got vast experience in the game. Eric put up a great fight against him and watching it I thought ‘that’s the type of guy that I want to be in.’ Someone that fights with their heart on their sleeve, that’s why we’re here now. It’ll be a comparison in the back of my mind but that doesn’t make me a better fighter than him or vice versa if I do better or worse than Deontay. “A man that gets up after being knocked down has my full respect and he has shown he has massive heart. His mentality is that he’s got nothing to lose, and that makes him dangerous. There’s been upsets in the past but that’s not happening at this stage of my career. 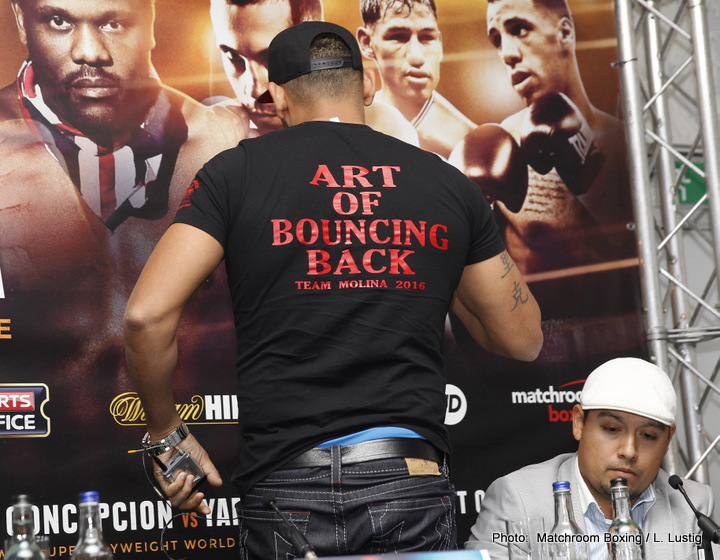 “Molina is Wladimir Klitschko, he is David Haye, he is Wilder. He is a hurdle I have to overcome. It’s not about them, it’s about me. I won’t disrespect Eric, but I don’t play games, I come to dominate. I don’t care how long the fight with Molina goes; one or 12 rounds, I just need to dismantle my opponent. “I’m not fighting Klitschko. 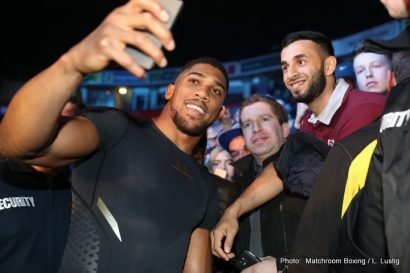 He’s going to be there on Saturday, as is Haye, but they’re not in front of me. My career, my discipline and my consistency, that’s the package that we’ve been sending out to the rivals and that speaks louder than any performance on Saturday. I want to win, I want to look good and I want to entertain — but the most important thing for me is going in there and doing the job. “I’m not learning in the shadows, I’m under the bright lights on Box Office in the UK and on SHOWTIME in the U.S. I have to perform every time that I box. There’s so many wolves in the pack that want to come and destroy what I’ve built. “We’re close to getting some huge fights. If I get through Saturday then I fight Klitschko; it doesn’t get much bigger, so the division is moving forward. People have just got to be patient and enjoy the ride. “Knockout is the only way I am going to win. I’m not here to take it on points, I am here to put him on the floor and take his belt. 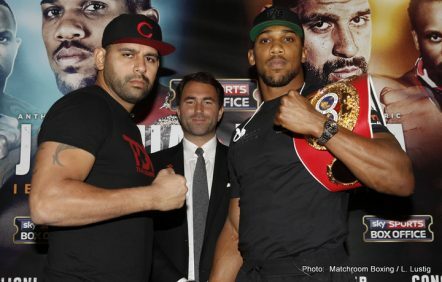 Any heavyweight can KO any other heavyweight, and I can KO Joshua. I’m a hard-punching heavyweight so I am extremely confident. 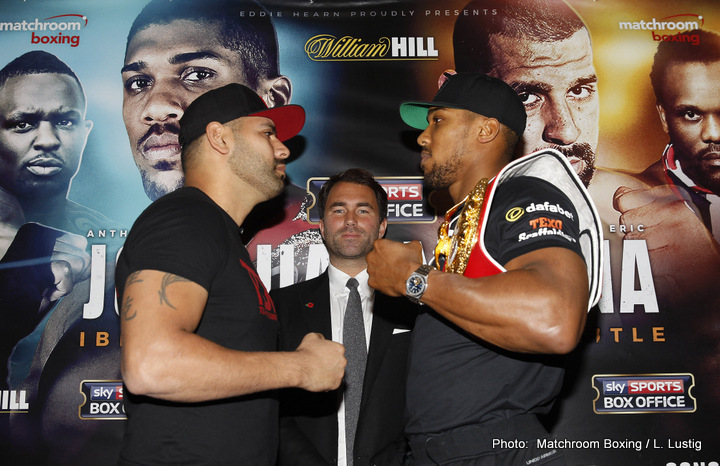 “I’m unpredictable – and any man in this division can be KO’d on any night. To become champion, that’s the ultimate goal, and I think I have what it takes to knock him out. 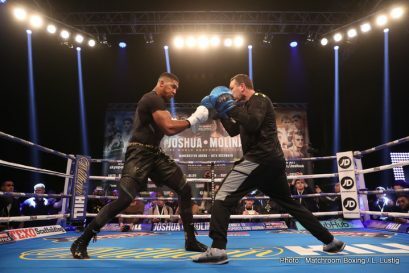 “Joshua has great balance, he’s athletic, tall, uses his reach – but there are things about him we don’t know yet and he knows it, too. We know he can punch and has the attributes to become a legend, but that missing piece of the puzzle is the chin. Can he take a punch? He hasn’t taken anything up to this date. A good boxing puncher can KO you with a shot at any given moment. “I don’t question his stamina, but I do want to see him take a good shot. It’s the big question – and I’ve hurt everybody that I’ve been in the ring with. Does he have grit and determination? We’ll find out. “I’ve been an underdog all my life so it doesn’t faze me. 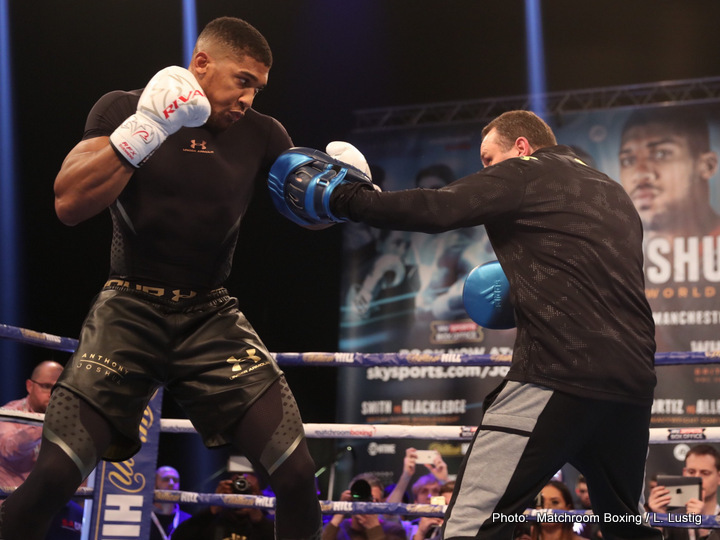 Joshua is young, he’s strong, he’s got all the attributes of a great champion. But there are a lot of things that he’s yet to experience in the ring, and that’s what I have to capitalize on. Eventually he has to go through those things and get taken to those places that he hasn’t been yet. I have to take him there to win. “Who else in the last 18 months is going to fight Joshua and Wilder? Who is willing to do that to win? No one wants to get in with this guy. This is my route to get the world title. It’s not about Klitschko, it’s about me. Any man can be destroyed on any given night. Joshua knows that’s true. He’s got to beat me to get the fight, but I have a great chance to KO this guy. “I don’t pay too much notice to what people think. When I fought Wilder the whole world gave me one round — that’s it. He’s going down in one round, he’s going to get blasted away. I’ve heard it all before, all the negative feedback. Let people think what they want, I feed off it. I have nothing to lose in a fight like this and everything to gain. It’s a very dangerous fight and the type of fight that I really perform in. 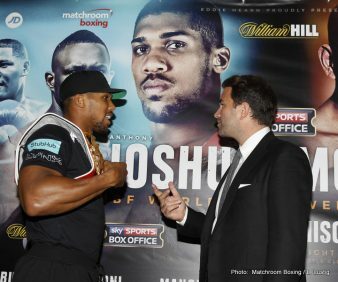 “Dillian Whyte has given Joshua his toughest test so far, then probably (Dominic) Breazeale. He hasn’t been pushed. He hasn’t been taken to a place where he’s had to dig deep. There are some holes in his game that we feel we can execute and hurt him. “Lots of people didn’t want the fight; it’s a business and I wanted it. I’ve shared the ring with Wilder and now I’m going in with Joshua. These aren’t just words; I’m putting it into action, there’s a difference. “Wilder is the most dangerous heavyweight in the world, Tyson Fury is the most skilled, the combination of both would beat Johsua. The most feared is Luis Ortiz. You have the heavyweights that no one wants to get in with. Everyone is calling everyone out, but when it comes down to it, it means nothing if you don’t get in there. You just have a certain bunch of guys that don’t want to fight another bunch of guys. 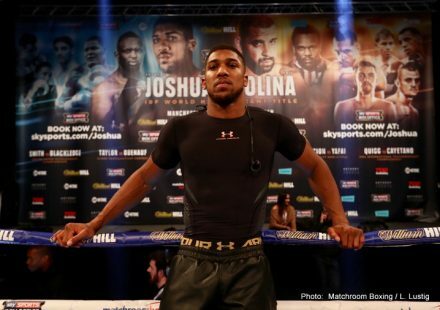 WBC Heavyweight World Champion Deontay Wilder will join the SHOWTIME announce team as a guest analyst for the IBF Heavyweight World Championship fight between undefeated champion Anthony Joshua and American challenger Eric Molina on Saturday, Dec. 10, live on SHOWTIME (5:30 p.m. ET/2:30 p.m. PT). Wilder (37-0, 36 KOs) will join host Brian Custer and analysts Al Bernstein and Paulie Malignaggi for the SHOWTIME BOXING INTERNATIONAL® presentation from Galen Center at USC in Los Angeles, site of that evening’s SHOWTIME CHAMPIONSHIP BOXING telecast. The “Bronze Bomber” just completed rehab for a fractured right hand and torn right bicep (see video above) as he (Wilder) sets his sights to unify the division in 2017. Wilder is acutely familiar with Molina, having defeated the fellow-American in the first defense of his title in June, 2015 on SHOWTIME. 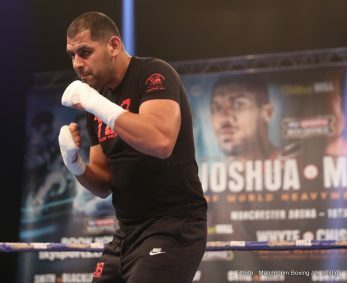 Joshua is making the second defense of his title against Molina, who is getting his second shot at a belt in his quest to become the first Mexican-American heavyweight world champion. 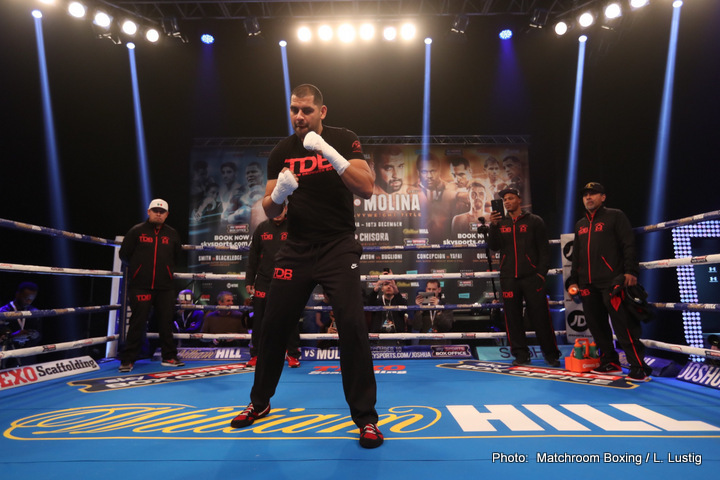 An encore presentation of Joshua vs. Molina will air as part of the SHOWTIME CHAMPIONSHIP BOXING telecast later that evening, following the main event showdown between WBA Featherweight World Champion Jesus Cuellar and three-division former champ Abner Mares. In the opening bout, Jermall Carlo will defend his IBF Junior Middleweight World Championship against fellow-undefeated challenger Julian Williams.